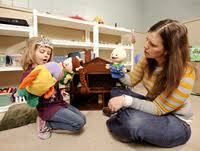 Play Therapy research papers discuss psychology case studies that reveal the successfulness of the use of playing with children as a communication therapy. Play therapy research shows that play therapy provides a method for parents to learn a more effective way of communicating with their children through play activities. For parents, learning the process of play therapy gives them the tools necessary to communicate with their children through the child’s natural medium: play. As parents learn to communicate with their children through play activities, there are several dynamic benefits that emerge from the situation. Because children are unable to communicate verbally, a parent’s interest in play as a primary means to communicate fosters a sense of understanding and confidence in the child. In many respects the process of play therapy shows children that parents are interested in understanding and helping them through a difficult time. Although these emotions are not clearly understood or expressed by the child, the overall process of play therapy can help children feel more secure in their relationship with their parents. In addition to the improvement of the child’s relationship with the parent, as parents continue to learn to effectively communicate with their children, parents begin to feel more comfortable with their roles as parents. In many cases, it seems that parents often come to therapy distraught and angry because they are simply unable to “control” their children. As parents learn how to communicate with their children, feelings of inadequacy and incompetence are often replaced with feelings of confidence and empowerment. Play therapy is a wonderful method for parents to learn how to communicate with their children when they are relatively young. When it comes to older children, however, play therapy is not as effective in dealing with problems associated with development. As verbal skills mature and children become more aware of their emotions, many play therapy researchers recommend the use of direct coaching of parent-child interactions as a means to help shape children’s behavior. Paper Masters writes custom research papers on Play Therapy and discuss psychology case studies that reveal the successfulness of the use of playing with children as a communication therapy.